It’s no accident that the main road through Attercliffe, the industrial east end of Sheffield, is called Attercliffe Common. Until 1811 it was indeed agricultural common land, where the highwayman Spence Broughton was gibbeted in 1792 near to the scene of his crime. His name and the location are commemorated in nearby Broughton Lane. After the enclosure the salubrious country homes and villas of the valley were overrun by steelworks and housing, so that only their names survive in the street-plan – Attercliffe Old and New Halls, Woodbourn Hall and Chippingham House, though part of the Jacobean Carbrook Hall, with its original panelling, plaster ceilings and ghost, survived and still survives as a public house. Of similar age to Carbrook Hall is another unlikely survival, Hill Top Chapel, a simple Gothic-survival building of 1629, built ostensibly because the journey to Sheffield parish church, now the Cathedral, was said to be impossible in winter. It was built by subscription, with contributions from William Spencer of Attercliffe Hall and Stephen Bright (1583-1642) of Carbrook Hall. His younger brother Rev John Bright (1594/5-1643) was vicar of Sheffield from 1635 until the year of his death. Both of them, like most influential people in Sheffield, were Puritans. Stephen Bright’s son, John (1619-1688), was an important figure supporting Parliament in the Civil Wars, and politically astute enough to be awarded a baronetcy at the Restoration. He retired to Badsworth, near Wakefield. The Brights’ puritan influence remained in Attercliffe, where a dissenting academy was founded in 1686. The steelmaker Benjamin Huntsman was buried in the Hill Top graveyard in 1776. The Hill Top Chapel remained the only Anglican place of worship between Sheffield and Rotherham until a new parish church, Christ Church, Attercliffe, was consecrated in 1826. By the 1840s the chapel served only for funerals in the surrounding graveyard. After Attercliffe Cemetery opened in 1859 alongside Christ Church, even that function declined, yet the chapel and the graveyard survived amid the grimy industrial works and densely packed streets of terraced housing. The structure was reduced and substantially rebuilt by John Dodsley Webster in 1909. The exterior featured in the music video of ‘Sensoria’, by the Sheffield group Cabaret Voltaire – https://www.youtube.com/watch?v=c2vCpT1H7u0 – made in 1984, an interesting moment of change in the landscape of the Lower Don Valley. In the late 1990s Hill Top Chapel accommodated an offshoot of the Nine o’Clock Service [http://www.independent.co.uk/news/nine-oclock-church-relaunches-services-1303804.html], which was witnessed by a bemused mystery worshipper from the Ship of Fools website: http://shipoffools.com/mystery/1998/026Mystery.html. The building is now used, appropriately, by a Presbyterian congregation that proudly recalls the building’s Puritan heritage: http://sheffieldpres.org.uk/about-us/hill-top-chapel. The Sheffield’s Heritage (October 2nd-6th 2017) tour includes a visit to the former industrial East End of Sheffield. For details, please click here. This entry was posted in Exploring Attercliffe, Sacred Places, Sheffield's Heritage on June 10, 2017 by Mike Higginbottom. Some historians suggest that the fact that Attercliffe is mentioned first in the Domesday Survey of 1086 – “Ateclive & Escaveld” – is an indication that Attercliffe was more significant than Sheffield before the building of the Norman castle. Certainly there was a manor house belonging to the Blunt family by 1176 and this house was rebuilt in 1462 and became Carbrook Hall. It was purchased by Thomas Bright, lord of the manor of Ecclesall, in the late-sixteenth century and the surviving stone-built wing was built c1620 for Stephen Bright (1583-1642), bailiff of the Earl of Arundel’s Hallamshire estates from 1622 and later lord of the manor of Ecclesall. Stephen Bright’s son, Sir John (1619-1688) helped co-ordinate the siege of Sheffield Castle in 1644 from the Hall. The Brights’ Carbrook estate passed repeatedly through the female line, and it seems that later generations let the building from early in the eighteenth century. The house was more extensive than the surviving remnant: it was surveyed by William Fairbank in 1777, and E Blore’s engraving in Joseph Hunter’s Hallamshire: the history and topography of the parish of Sheffield in the county of York (1819) shows an elaborate jettied timber wing and other outbuildings. There remain two elaborate interiors with fine oak panelling and plasterwork, possibly the work of the same craftsmen who decorated the Little Keep at Bolsover Castle. The lower room has an oak chimney piece dated 1623 with Corinthian columns and strapwork and a depiction of Wisdom trampling on Ignorance, with scrolls containing mottoes. A very similar fireplace, originally at Norton House, is now preserved at the Cutlers’ Hall. The stone fireplace in the upper chamber is stone, and instead of columns features unusual caryatids. In a nearly circular cartouche is an image of the pelican in her piety. Carbrook Hall became a public house sometime in the nineteenth century – all surviving photographs show it without the timbered wing – and in that guise it became an unlikely survivor of the days when Attercliffe was rural: http://www.sheffieldcamra.org.uk/2016/10/heritage-pubs-with-dave-pickersgill-carbrook-hall. In recent times it has traded on a reputation as “the most haunted pub in Sheffield”, giving rise to investigations and reports that lose nothing in the telling: http://www.project-reveal.com/carbrook-hall-ghosts/4540202323. In February 2017 the Carbrook Hall closed as a pub, to the distress of CAMRA and local workers. The new owner, West Street Leisure, did not at first disclose future plans for the building, beyond saying that its status as a Grade II* listed building would be respected. Conservationists are concerned that if it stands empty it will be vulnerable to vandalism: [http://www.thestar.co.uk/our-towns-and-cities/sheffield/fight-to-protect-historic-haunted-pub-in-sheffield-passes-first-hurdle-1-8539851]. This rare survival, a fragmentary reminder of the days when Attercliffe Common really was common land and Meadowhall was surrounded by meadows, contains one of the finest historic interiors in the city. The next chapter in its long history is a transformation into a Starbucks coffee shop: https://www.thestar.co.uk/news/starbucks-drive-thru-plan-for-carbrook-hall-sparks-debate-1-9474416. This entry was posted in Country Houses, Exploring Attercliffe, Sheffield's Heritage on June 4, 2017 by Mike Higginbottom. I’ll journey some distance to hear Mike Spick, the distinguished Sheffield local historian, and indeed I travelled as far as Chesterfield when he gave his Sheffield Canal presentation to the North-East Derbyshire Industrial Archaeological Society. Otherwise I listened to Mike’s presentation with admiration for the accuracy of his account, the richness of his illustrations and his adept use of PowerPoint to animate and explain. The Sheffield & Tinsley Canal, not quite four miles long, climbs from the River Don at Tinsley, very near to the latter-day M1 viaduct and the much-lamented cooling towers that were demolished in 2008, by a flight of eleven (originally twelve) locks to its terminus on the edge of Sheffield city centre. For over a century before it was built the nearest navigable waterway was the River Don Navigation at Tinsley; the next nearest was the River Idle at Bawtry, over twenty miles away. The canal was financially supported and its route along the south side of the Don Valley was directly influenced by the estate of the Duke of Norfolk, the ground-landlord for much of Sheffield. To please the Duke a branch canal was built to his Tinsley Park collieries. The course of the Greenland Arm is now Greenland Road, part of the Sheffield ring-road. Authorised in 1815, four years after Attercliffe Common was enclosed, the Sheffield Canal opened with much celebration in 1819. It was the first effective means of breaking Sheffield’s physical isolation, surrounded by seven hills. Its heyday lasted barely twenty years, until the Sheffield & Rotherham Railway opened in 1839, following (as it still does) the north side of the valley. For thirty years Sheffield passengers and goods headed east to Retford or north to Rotherham in order to travel south to London. Only in 1870 did the Midland Railway complete its direct line from Chesterfield, the present-day route via Dronfield that to this day is known to railwaymen as the “New Road”. The canal continued to serve the city under railway ownership well into the twentieth century. Indeed, a new warehouse was built, for lack of anywhere else to put it, over the quay in 1896 and is known for obvious reasons as the Straddle Warehouse. The last commercial cargo went down the canal in 1980. It never became unnavigable but it was practically derelict by the time the opening scene of The Full Monty was filmed near Bacon Lane in 1997. Now, as part of the regeneration of the Lower Don Valley, the canal has become almost unrecognisably emparked. The terminal basin is a marina called Victoria Quays, presumably commemorating the defunct Victoria railway station. The Quays, like the former station, is out on a limb, not easily accessible from the city centre. There are hotel boats offering an alternative pied-â-terre to the corporate hotels, and a trip-boat offering “cruising for all occasions”, along the surprisingly silvan Attercliffe Cutting, over ’Ackydoc and down the locks to Tinsley. In fact, it’s an ideal venue for a birthday party. This entry was posted in Exploring Attercliffe, Sheffield's Heritage, Transports of Delight on March 24, 2017 by Mike Higginbottom. I’ve known Tinsley Park Cemetery, Sheffield, all my life, because my maternal grandfather and a bevy of Salvation Army aunties and uncles lie there. When you visit a cemetery for a funeral, or even simply to tend a grave, as my mother and grandmother did when I was little, you don’t take notice of the surroundings. The cemetery was opened in 1882 by the Attercliffe Burial Board to supplement their earlier cemetery adjoining the burial ground of Christ Church parish church, a Commissioners’ church built in 1826 and demolished after it was ruined in the 1940 Blitz. In recent years, when I’ve found my way to Tinsley Park Cemetery, I’ve been intrigued by the quality of the architecture of the funeral chapels, a typical pair – one for the Church of England, the other for the Nonconformists – with an archway, a timber loggia, a clock in the gable and twin bell-turrets. 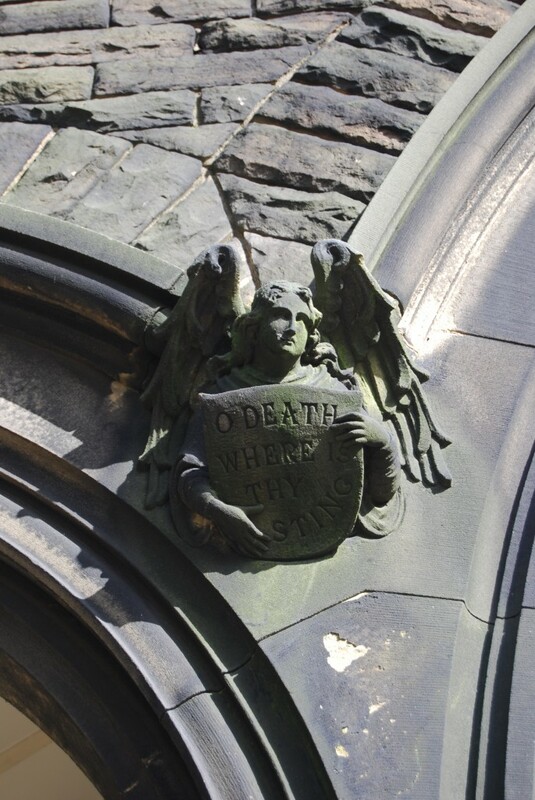 Each of the arches of the carriageway is decorated with angel headstops carrying Biblical mottoes. The superintendent’s house incorporated a boardroom for meetings. The cemetery was designed by a local practice, Holmes & Johnson. Samuel Furness Holmes (1821-1882) was essentially a civil engineer: he had been a highway surveyor and was Borough Surveyor from 1864 to 1873. It’s likely therefore that the architectural work was done by his partner, C H Johnson, about whose career and work I’ve so far been able to trace nothing of any substance. The Burial Board was taken over by the city in 1900, and Tinsley Park Cemetery remains under the care of what is now called Sheffield Bereavement Services: https://www.sheffield.gov.uk/caresupport/bereavement/cemeteries-directory.html?showdetails=Show&uuid=b11e9afa-d9d8-4ee6-b005-b3ef498370f7&isDirectorySearch=true. The Anglican chapel is still available for funeral services, while the Nonconformist chapel is a store. This entry was posted in Cemeteries, Sewerage & Sanitation, Exploring Attercliffe, Sheffield's Heritage, Victorian Architecture on January 6, 2014 by Mike Higginbottom. Some buildings stick in the memory for entirely sentimental reasons. I passed the Wesleyan Reform Chapel, Bodmin Street, Attercliffe, Sheffield every morning in my first five years of schooling. My Auntie Nellie lived literally next door. It formed the background to my earliest memories of backyard Bonfire Nights when Uncle Charlie was in charge of the box of matches: in Coronation year the biggest bang of all came when Auntie Nellie’s new pressure-cooker, inexpertly screwed down, exploded and spattered mushy peas all over the kitchen ceiling. My latest memory of this thriving temple of Methodism is of my cousin Cathryn singing at a chapel anniversary in the early 1960s. It’s an austerely attractive, utterly unremarkable building, unlisted, invisible in the Sheffield Local Studies Library index. Built in 1890, its foundation stones were laid by a star-studded cast of Sheffield’s most important Methodists, such as Jethro and Samson Chambers, Robert Hadfield and Frederick Mappin – all of them men of steel with Attercliffe connections, the latter two later to become baronets. Its registration for marriages was cancelled because it was no longer used for worship in 1966. 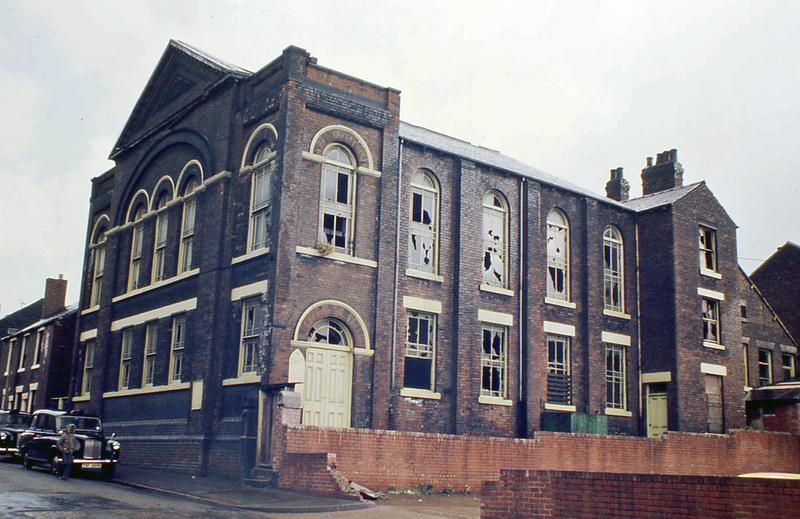 My 1977 image of the building shows the brickwork still encrusted with industrial grime and most of the windows smashed. No-one would have given tuppence for its chances of survival. Nowadays it sparkles: it’s well-maintained; its windows are renewed and its brickwork is beautifully cleaned. It serves as the Jamiyat Tableegh ul Islam Mosque. So historic buildings which are not worth listing can survive if someone finds an appropriate use for them that will justify their upkeep. This entry was posted in Exploring Attercliffe, Sacred Places, Sheffield's Heritage, Victorian Architecture on January 2, 2014 by Mike Higginbottom. When the Victorian Society South Yorkshire Group ran a historic walk of Attercliffe in 2010, one of the buildings they were able to point out was the Adelphi Cinema (1920), one of Sheffield’s two listed cinemas and currently a cause for conservationist concern. Originally located up a cul-de-sac, it has an interesting façade of buff and blue faience with a stubby little dome, designed to catch the eye. 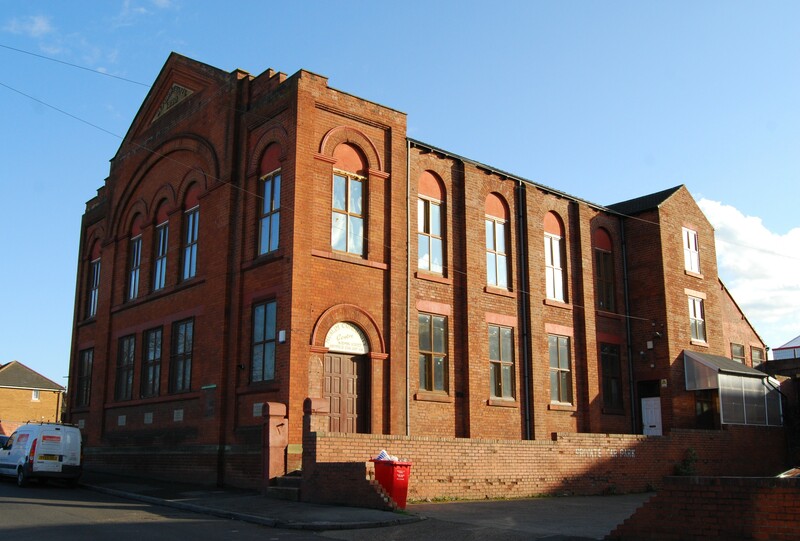 Now that the surrounding buildings have been cleared, it’s more visible from the main road and forms one of a group of historic buildings alongside the former Attercliffe Baths (1879), the former Attercliffe Library (1894) and one of Attercliffe’s two Burton’s stores. All these survive alongside the site of the Don Valley Stadium, formerly Brown Bayley’s steelworks, and shortly to be redeveloped: there seems to be an opportunity waiting to be taken to develop the possibilities of this location. The Baths and the Library have been converted into rather sterile office and conference facilities, which at least safeguards the fabric, but the Adelphi is more of a problem. It closed as a cinema in 1967, and operated as a bingo club until well into the 1980s. There was a project to take advantage of its elegant classical interior as a gay club, and eventually it was transformed into a rock venue. It’s listed Grade II, which does nothing to keep the rain out. Though it appears to be in fair condition, it badly needs a sympathetic owner and a way of earning its keep. Now that the Stadium has gone, the area is largely deserted apart from the patrons of the sad massage parlours up the road. Yet the Adelphi stands on the main road between Sheffield, Rotherham and the M1 motorway. There’s no shortage of car-parking. It’s a possibility waiting to be turned into a practicality. For details of the Victorian Society South Yorkshire Group’s future events and conservation activities, go to http://www.victoriansociety.org.uk/south-yorkshire. This entry was posted in Exploring Attercliffe, Fun Palaces, Sheffield's Heritage on December 30, 2013 by Mike Higginbottom.